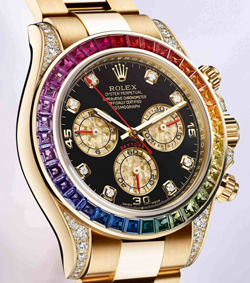 Rolex catalog 2012: The new products presented at BaselWorld. That is a name more than a symbol. In the framework of the World Exhibition of Haute Horlogerie Rolex presented its new models. We have seen the revolutionary Sky-Dweller, union between high tech and style, now we see all the other news that we are sure will delight all fans. In Basel, therefore, the brand has shown the evolution of continuity, with three iconic models that benefit from the latest technical developments and aesthetic of the brand, the Submariner, Yacht-Master and Datejust II. Room for creativity, with models adorned with stylish bezels and dials new jewel, the Cosmograph Daytona, the Daytona and Datejust Lady 31, Lady-Datejust, Day-Date and Day-Date II. The evolution of a historic or legendary launched in 1953, is a new chapter in the Submariner model of modernity and tradition. The clock, which has become the archetype segnatempi divers, the new version mounts the disk Cerachrom bezel, black ceramic, and a dial with indexes and hands Chromalight larger, in order to ensure perfect readability in the dark. The case of 40 mm steel is 904L, corrosion-resistant. To ensure a perfect fit securely mounts the Submariner an Oyster bracelet, always in steel, with safety clip Oysterlock atto precaution prevent any accidental opening. Watch skipper for excellence, the new Yacht-Master has a marine blue dial, in line with the world of the sea. Also in this case have been and latest innovations of Rolex as Rolesium, special alloy steel and platinum Which Guarantees excellent performance in terms of ergonomics and comfort, as well as making all other reliable elemente, the bezel and the bracelet clasp. New for the bi-directional rotating bezel in platinum 950 Which has a new rotation system for increased At strength, while the use of Chromalight Allows its use even in the dark. Particular attention paid to Also Oyster bracelet that mounts between the other Easylink, a mesh extension atto Increase the length of about 5 adapting the clock to any situation. For the first time presents the Rolex Datejust II version with all-steel bezel that complements the model Rolesor with bezel 2009. The new model features a 41 mm case and celebrates the Oyster Datejust with date Perpertual dominated by magnifying Cyclops. Strong lines and contemporary, the new versioe steel 904L is coupled to the Oyster bracelet that, anche in this case, is Supplemented by the Easylink extension. A riot of luxury in the new version in yellow or white gold 18 ct. To make truly magnificent clock bezel that shines through the colors of the rainbow sapphires of different colors embedded, while diamonds shine on the lugs and crown protector on the shoulder. It is not finished, as the dial, painted black, has eleven diamonds and gold Gold Crystal counters, exclusive process of Rolex. Extreme femininity and elegance in version Datejust 36 mm gold 18 ct Everose. Beautiful lacquered black dial with 262 diamonds that created a modern and stylish decoration. The bezel has on the entire surface 60 baguette-cut diamonds, while on the other there are about 120 brilliant-cut. 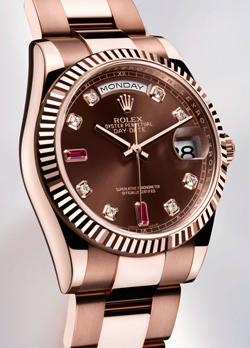 Everose All in gold, exclusive Rolex alloy, created in its own foundry, to Which Is Added a touch of platinum to create a new and unique color. Even diamonds and gemstones in jewelery model Perpertual Oyster Day-Date Gold 18 ct Everose with bezel that on its face those “chocolat” mount baguette cut rubies indices 6 and 9. ‘s Oyster Perpetual Day-Date II has 41 mm chose the dial ” champagne “in 18K yellow gold bezel has Entirely covered with baguette-cut diamonds. L ‘Perpertual Oyster Datejust Lady 31 31 mm opted for the ‘ yellow gold 18 ct dial with “champagne” and has a thin bezel with 48 diamonds, while the indices 6:09 There are 16 rubies. A hymn to the beauty and luxury.